Mercedes caused quite a stir last week with their twin attack on rival dealers selling cars “no one wants”, while unleashing an intense price war for the year ahead. One of the areas they emphasised was the Urban trim they’ve got on the likes of the revised compact GLA crossover, which I had on test some time back. You don’t need me to tell you cars such as this are in big demand: they’re smart-looking, different and everyone else is driving one. Mercedes are hammering home their pitch on price/value. They did reduce prices by 10pc last year and have revised that to 6pc. Rivals are equally active in pushing and point to how they have other ways of attracting buyers and holding market share. At this level, competition is probably at the keenest I’ve seen it – in large part because the customer base is projected to expand for years. Anyway, they’ve given this revised GLA an upgrade. Items now standard include heated front seats, Garmin sat nav preparation, air con, Dynamic Select comfort settings, remote online connectivity, LED lights and high-beam assist. Prices start at €34,759 (GLA180d), which is lower than for the old model. I did mention a price war. New LED headlamps replace bi-xenons, while inside there are new seat covers and trim. I always think the GLA is one of the less-SUV-looking cars in the segment. It looked really well in Urban trim and while roominess wasn’t extraordinary, there’s no doubting they’ve got themselves a smart interior here. Purely from a practical, everyday point of view, however, they have the ventilation buttons way, way too low. Annoying to have to stretch so much. It was sharp enough to drive, though I felt the suspension was too stiff at times – ragged city streets will do that to all but the best of set-ups. I was a bit disappointed at how gruff the diesel engine could be, especially in quick, pick-me-up lower gears. It was a totally different story on the smooth, mid-range speeds of the motorway, where it went like a bird. These are hard cars not to like and I know there is great appeal in having a small Merc that looks the business and largely does it as well. I wouldn’t be a major fan of this diesel version, though it was as frugal as anything of that ilk I’ve driven this year – its €190/year road tax is testament to that. Leaving aside my few criticisms, I found it a great little bus around town, easy to park and with good visibility. With a new family of engines being rolled out I expect criticisms, like mine, of noisy diesels to quickly fade. Meanwhile, might I suggest taking a look at the GLA 180 or 200 petrols, particularly if you’re not going to be doing big mileage. 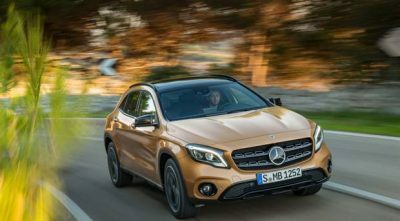 Mercedes GLA compact crossover, auto, diesel, 2,143cc, 136bhp, 108g/km, €190 road tax. Urban trim standard spec: climate, cruise control, LED headlamps, adaptive high-beam assist; sports/heated seats, attention assist, twin exhaust system, remote online, pre-install Garmin Map Pilot, 12v socket in rear, 18ins 5-spoke alloys, stop/start, off-road ‘comfort’ suspension, aluminium roof rails, lots of chrome touches, inserts (load sill guard). Price: €38,855. Extras (metallic paint, reversing camera, Artico leather and ‘smoker’ pack). Total price: €40,767.